Double-charged for the same icon: What to do? All icons from Iconfinder can be bought once with no additional charge when downloading the same icon again and in different formats. In rare cases, the purchase transaction can fail. 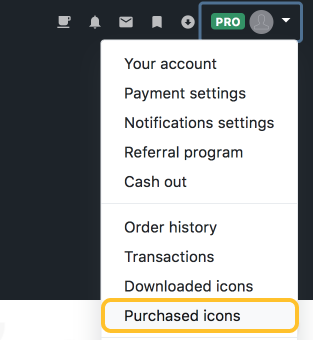 Click on Purchased icons to see the icons that you have bought. In case you tried to purchase the same icon again and noticed that your account was charged duplicate times, please let us know by sending an email to support@iconfinder.com. We will refund you for the extra charges. Duplicate charges can happen due to server issues that affect the downloads on the Iconfinder website. Accept our apologies for this beforehand.